Compared with some of the prior IBM (IBM - Get Report) earnings reports that have sparked selloffs, the numbers provided in Big Blue's latest release weren't especially harsh. Even if (as usual) they don't look as solid as they might at first glance once one goes through the fine print. The fact that IBM shares have nonetheless fallen over 5% in response to the numbers might say something about how, following years of underperforming IT peers and promising major top and bottom-line turnarounds, investor patience has run thin. IBM reported first quarter revenue of $19.07 billion (up 5% annually) and adjusted EPS of $2.45, topping consensus analyst estimates of $18.83 billion and $2.42. It also reiterated guidance of 2018 EPS of "at least" $13.80 (compares with 2017 EPS $13.92) and free cash flow (FCF) of $12 billion (compares with 2017 FCF of $13 billion). Though not spectacular, those figures aren't on the surface enough to warrant selling off a stock that has largely tread water since the spring of 2016. But they look softer after one remembers IBM's revenue growth got a 5-percentage-point boost from a weak dollar, larger than Q4's 3-percentage-point boost. Growth was flat on a constant-currency (CC) basis, which was a little worse than Q4's 1% CC growth and guidance for Q1's CC growth to match Q4 levels. Moreover, a very long list of enterprise tech firms have posted strong reports since January, raising hopes a bit that IBM would do the same. Last week, research firm Gartner forecast global IT spend would rise 6.2% this year -- it cited both a weak dollar and spending increases that in CC are on par with global GDP growth. In addition, there's some disappointment over IBM's Q1 adjusted gross margin (GM): It officially fell 70 basis points annually to 43.7%, and fell 30 basis points to 44.1% after backing out restructuring costs for IBM's Systems (hardware) segment. Both numbers are below a 45.1% consensus. Margins have been pressured for a while by a shift towards cloud revenue streams, but IBM has promised that they'd stabilize in 2018. Outside of lower margins, earnings were hurt by $375 million in restructuring costs and a $130 million drop in intellectual property (IP) income. As expected, IBM's EPS benefited from a low 16% adjusted tax rate. They also got a slight lift from $800 million worth of stock buybacks. With the help of the aforementioned currency boost, 3 of IBM's 4 product reporting segments topped consensus revenue estimates. The exception was the Systems unit: Its sales rose 8% annually (4% in CC) to $1.5 billion, missing a $1.69 billion consensus. While the segment's mainframe revenue rose 59% thanks to an ongoing upgrade cycle and its Power server revenue rose 3%, storage revenue fell 15%. 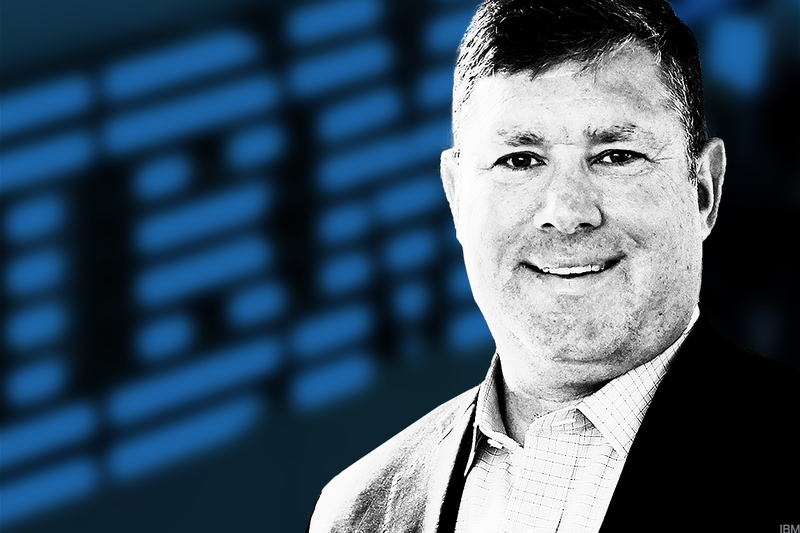 On the earnings call, CFO Jim Kavanaugh called IBM's storage performance "disappointing," and blamed a mixture of competition, price pressure and sales execution issues. Rivals such as HP Enterprise (HPE - Get Report) and NetApp (NTAP - Get Report) have been reporting stronger storage growth, as industry demand benefits from an Intel (INTC - Get Report) server CPU upgrade cycle. IBM's Cognitive Solutions segment, which covers much of its software sales and is easily its most profitable unit, saw revenue grow 6% in dollars but just 2% in CC. The company's services segments -- Global Business Services (GBS) and Technology Solutions & Cloud Platforms -- respective grew 4% and 5% in dollars, and each saw 1% declines in CC. Here, it's worth noting that Gartner expects global enterprise software and IT services spending to respectively rise 11.1% and 7.4% in dollars this year. There are still some bright spots when one goes over the details. With the caveat that they can fluctuate a lot from quarter to quarter, IBM's services signings rose 10% annually to $9.3 billion, which was a nice reversal from Q4's 10% drop. And the revenue run rate for its "as-a-service" cloud app, app platform and infrastructure revenue streams grew 25% annually to $10.5 billion, which is an improvement from Q4's 20% growth. IBM also reported (without giving a sales figure) a 60% increase in security revenue. But the segment revenue figures make it clear that momentum in areas such as cloud apps/services and security is being offset by pressures within older, non-cloud, software and services businesses in fields such as databases, operating systems, consulting, tech support and business process outsourcing (BPO). And that when one combines the good and the bad, the end-result is a company whose forex-adjusted growth remains noticeably below that of peers such as Microsoft (MSFT - Get Report) , Accenture (ACN - Get Report) , SAP (SAP - Get Report) and Dell Technologies, and for which growing FCF remains a challenge. Investors certainly haven't been ignoring such challenges in recent years, as IBM's 5-year chart makes clear. But after seeing Big Blue mostly sit out a massive 2-year tech rally, and after seeing Warren Buffett's Berkshire Hathaway (BRK.A - Get Report) unload nearly all of its IBM shares, it looks like markets are now even less forgiving of bad news than before.